I called Gary today and he/they does/do not have cars back together, so they will not make it. He says maybe Wilkesboro. I also left a message on both Rodney's and Alanna's phones. We'll see! Post subject: Re: Race in Fairlawn, VA - Motormile Dragway - June 15-17 - 3 races! OK, folks! We have a THIRD SLANT 6 RACE confirmed next weekend at Motormile. Friday night will be a makeup for one of the Mason-Dixon races, then regular races Sat and Sun. Friday gates open at 6 PM, runs at 7 PM. Updated roll call for Motormile: Did I mention we have THREE races folks??? 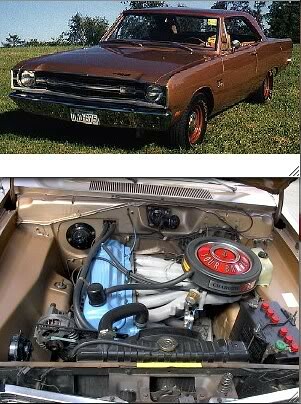 6) Brian Mimken - 73 Duster Sixy Beast or other car? I have the trophies and some cash for the purse and some goodies to eat I will bring along! I am still working bugs of of the ruster. Currently at tnt at the home track. Trying some things to see if i can get all of the new parts to play nice with one another. Fortunately my track also has a tnt next thurs as well. I should be getting there Thur evening or Fri morning. Doing some minor tweeks on the Valiant, and trying to improve the fuel mileage on the truck. If any one wants parts, I can deliver. Send a PM. I have confirmed the second Mason Dixon rainout makeup race will be run at Wilkesboro next month. I will post the 2018 Wilkesboro race thread next week after Motormile. Lou, is there ample parking at Motormile that we can try an park in the same area? If you have an idea of where that would be just let us know.Ryan & I will probably be there when the gates open Friday. There is a long row that runs along the back fence on the right after you come in the gate. There is more asphalt to park on there as compared to right close to the staging lanes. If we get in early enough, we can likely block off enough for 10-15 widths, closer to the stands and entrance to the staging lanes. We plan to be in line before 6 PM too to get in first and stake our territory. Jason Ernst is planning to make it with the LeMons Valiant, so I have moved him to the "yes" list above. All packed and ready to leave. Weather report looks good. I may or may not have internet access for the next 5 days, as I don't have a smart phone. I do have a (dumb)cell phone. Should be on my way in about an hour. See you folks soon. Well, my buddy Scott has come through for me again. I won't have the race motor done (not likely) for this weekend, BUT. Scott is bringing a stock engine and trans up to drop in and at least have the car running. So, It might be Sat and Sun or Just Sunday, but we will be there. We are having my Mom's 75th B-Day party at our house in about 3 hours. (Also Ryan's daughter's birthday) Then we will be loading up and getting ready to leave around noon tomorrow. I am planning to be at the gate between 5:30 & 6:00 if I plan things right. See Ya soon!! PS. I assume we just tell them we are racing Slant 6 at the gate ? Sounds great, Rick. They don't care at the gate. You pay $10 entry at gate, and then go up to the tower window to pay for racing. I will be there to give directions inside the track.